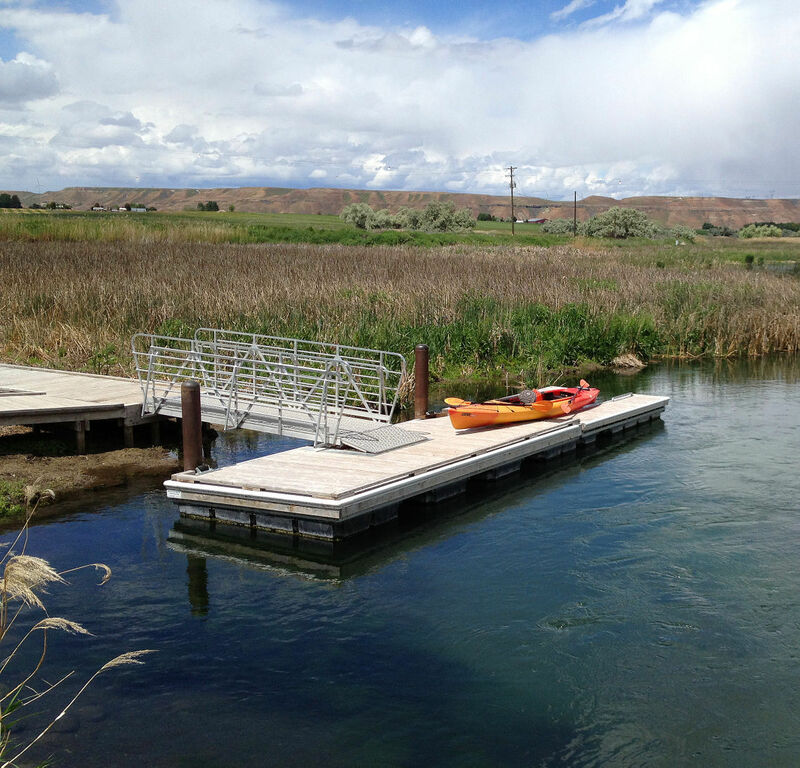 The Idaho Department of Fish and Game has made major improvements to its Billingsley Creek public access at the southern end of the Billingsley Creek Wildlife Management Area, photographed May 21. Last year, it added a notched put-in for canoes and kayaks. The primitive take-out for canoes at the north end of the Billingsley Creek Wildlife Management Area consists of a steep set of stairs. Plants have grown up through the stairs, some steps have tipped, and the dirt has dropped out of a couple of steps’ wooden frames. Red-winged blackbirds frequent the banks of Billingsley Creek. A pipe that used to interrupt the Billingsley Creek float has been buried, opening up a stretch of spring-fed creek that some say has the potential to become a destination fishery. Steve Brink, senior fisheries biologist for Idaho Power, walks down the fish ladder beside the diversion dam for the utility’s Lower Malad hydroelectric plant May 13. Below the grate at his feet, fish can swim up or down the ladder through a series of pools. In a small concrete room inside the Lower Malad fish ladder, a lighted window allows biologists’ cameras to record the fish that pass. Idaho Power fisheries biologist Steve Brink stands atop the utility’s Lower Malad diversion to explain the adjacent fish ladder. Brad Bowlin, spokesman for Idaho Power, talks in front of the gravel quarry where the Buhl Woman’s skeleton was discovered. Behind the stonework of the Malad River Powerhouse lies a tale of shrewd businessmen, false promises and an aggressive price war. The historic Malad powerplant’s interior in May 1919. Effects of the 1993 Bliss landslide are visible in soil south of the town. Aaron Utz, senior biologist for Idaho Power specializing in habitat mitigation, identifies birds attracted to beaver ponds on the utility’s Tuana Gulch property southwest of Bliss on May 16. Beavers encouraged by Idaho Power’s willow and cottonwood plantings in Tuana Gulch built dams and created ponds that are helping to restore native riparian species. Beside a beaver pond in Tuana Gulch, Idaho Power biologist Aaron Utz looks at the viceroy butterfly wings left behind after a bird’s meal. Exploring Tuana Gulch beaver ponds with biologist Aaron Utz, Idaho Power spokesman Brad Bowlin photographs aphids on goldenrod. Tourism promoters will tell you about the scenic byway and the state park. Outfitters will offer you whitewater rafting excitement, and a string of river access sites invite you to bring your boat and fishing pole. But our reporters will show you the Hagerman you never knew. On the Hagerman reach of the Snake River, the arts and sciences flourish — wine making and paleontology, sculpture and entomology. Our three-part series reports new developments in riverside business and recreation, but it also features innovation and exploration on the Hagerman reach. Could Billingsley Creek become the Silver Creek of the Magic Valley? Spring-fed Billingsley, a Hagerman-area tributary to the Snake River, might have the potential for a destination fishery akin to Picabo’s famed trout stream, some have suggested. Fish and Game stocks both brown trout and rainbow trout in Billingsley Creek, and habitat restoration efforts by some nearby property owners have reduced the sediment loads and instream impoundment that troubled the creek. “It’s more than suitable, if not ideal, for cold-water species,” Megargle said. But he hasn’t yet been able to figure out whether the creek has enough forage to promote fish survival and growth — in short, whether hatchery supplementation can generate a quality fishery on the Billingsley Creek Wildlife Management Area. The department tried creel surveys but couldn’t interview enough anglers along the creek. It tried taking stock of the fish populations itself, but two factors — a pipe crossing the creek just above the water surface about halfway down, and a primitive access point at the lower end — kept Fish and Game’s survey boats from navigating the WMA’s entire stretch of creek. At least three times, it tried tagging brown and rainbow trout and asking anglers to report their catches. “The returns were negligible, and we don’t know what that means,” Megargle said. Did anglers not have sufficient access? Were there just not enough people fishing? Or did the stocked fish die or move out of the area? Last winter, however, the pipeline’s private owner buried the pipe underground. That means recreational paddlers now can float the WMA’s entire mile of creek in their kayaks and canoes without encountering a barrier. Anglers’ boats — with or without motors — can too. And Fish and Game hopes to start getting some answers. “We’re asking people to go fishing — tell us what you find out,” said Dennis Newman, a regional habitat biologist for the department. That’s easier to do now. Over the past five years, Fish and Game has done a lot of work on the Billingsley Creek South put-in: built a permanent restroom, improved the parking area, constructed a boardwalk over the bulrush swamp and installed a floating dock. Last year, it added a dock with a notch cut for kayaks and canoes. It’s a lovely stretch for a paddle — easy enough for beginners and rich with wildlife. But the primitive take-out on the WMA’s north end means you’ll either paddle back upstream or face a steep set of stairs at the take-out, which doesn’t have a dock. Plants have grown up through the stairs. Some steps have tipped. The dirt has dropped out of a couple of steps’ wooden frames, leaving holes that could be treacherous to someone dragging a watercraft up the stairs. And when you reach the top, you still have a portage of a couple of hundred yards to reach the parking area. The take-out’s shortcomings are no surprise to Fish and Game. “This is a shoe that hasn’t been tied because we have a nice put-in and a mediocre take-out,” Megargle said. He’s seeking Fish and Game funding to move the parking area closer for larger watercraft, relocate the landing, add a kayak-friendly boat launch, install a restroom and add at least one switchback for an easier gradient. But this proposal will be ranked against others statewide to ensure it’s the best use of sportsmen’s dollars. The Hagerman Highway District's two-man crew has a lot of road to cover every year. In June, it started recycling and overlaying a mile of road west from the intersection of 1100 East and 2500 South. "It's a very big feat for this small highway district," said Rich Regnier, road foreman. "We take the original existing road and we grind that asphalt in place and put that into the base of the road, re-compact it and overlay asphalt on that base instead of cutting it and hauling it off and hauling it back." Regnier said asphalt is the No. 1 recycled product in the U.S. and only 3 percent of that is done is place. Though Hagerman is a small town, the road district has its own asphalt zipper that it bought used last year. Regnier, who has been with the district for six years, said this overlay job is the first for the highway district since 1997. The project started the week after Memorial Day and was expected to finish in July. "If it's proven successful and economical, we will start on the Hagerman Highway next year," Regnier said. "It's one of the main roads from Wendell to Hagerman. That road will be a little different. It has a lot of truck traffic and a lot of commuters." And because the Hagerman Highway District can afford to do only one mile a year, Regnier said, that project will take 4 1/2 years to complete. "We are going to try to do a mile a season," he said. "We have 56 miles. In my career I won't get them all done. Our infrastructure is struggling faster than we can rebuild it." Perhaps it’s an unlikely place to pioneer advances in automated video imaging. But below a trapdoor in a Malad River fish ladder, Idaho Power biologists are fine-tuning an imaging system that can count, measure and identify the species of fish that swim past the lighted viewing window in their small concrete room. In development since 2009, the imaging system’s first attempts borrowed technology from the medical industry, said Steve Brink, senior fisheries biologist for Idaho Power. Now it uses technology similar to Google’s image recognition. Brink and his colleagues aren’t in the dog business. But Idaho Power’s federal licenses for hydroelectric facilities require mitigation measures such as the fish ladder beside the diversion dam for the Lower Malad hydro plant. And they require the utility to monitor its mitigation. At the Lower Malad diversion, that means counting the rainbow trout and largescale suckers that swim from pool to pool through the ladder’s slots. At dams elsewhere, the counting might be manual — by humans watching hour after hour. Or video clips might be sent to contractors to process. But here, Brink’s team wanted to reduce the labor of monitoring. In that black-painted concrete room, the biologists and a contractor have progressed through seven or eight computers. The piles of tested but rejected lights are gone now, replaced by high-output LED bulbs made for the light bars on emergency vehicles. But half a dozen rejected cameras are still laid out like a high-tech graveyard. “We’re finally there now,” Brink said in mid-May, clicking through trout images on the system’s computer. Instead of operating many months behind, biologists in Boise will be able to process a month’s data in a day. They’ve taught the imaging system how to detect the water line so the surface’s movement won’t trigger the imaging. And accurate measurements of individual fish will enable the team to filter out “false passes” — fish that swim past the window and back again in a short time. The Lower Malad fish ladder was already remarkable for another reason: It’s not merely for fish swimming upstream to spawn. 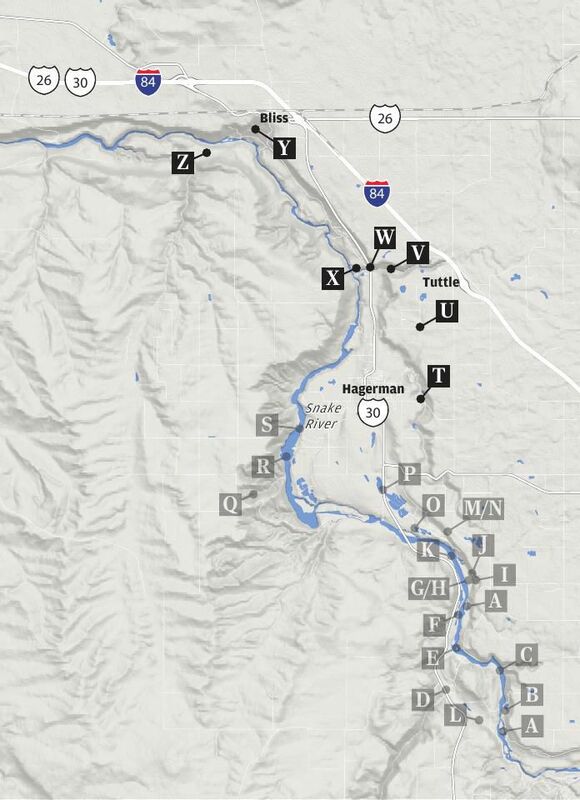 This three-mile section of the spring-fed, gin-clear Malad River — from the waterfall in the Malad Gorge unit of Thousand Springs State Park, to the Malad’s mouth at the Snake River — is excellent habitat for trout spawning and juvenile rearing. The Malad’s rainbow trout are fluvial: spawning in the tributary, migrating to the larger Snake to grow big, then returning to the Malad to spawn and rear young. During Idaho Power’s dam relicensing, Brink said, state and federal wildlife agencies wanted to restore that life history. So the Lower Malad fish ladder, built in 2008, has an unusual design meant to encourage downstream use, too. The ladder’s system of slots and pools needs only 10-12 cubic feet of water per second. But to attract fish, the ladder pulls in about 70 cfs. The extra water is screened, then piped to the bottom to rejoin the water that ran through the ladder. “That design has been very successful,” Brink said. More than 40,000 trout have passed through the ladder so far. The upstream movement of larger trout peaks in the winter for spawning, but fish use the ladder year-round. Because of spring water and genetic factors, biologists observe some level of trout spawning year-round in the Malad. A mile upstream, at its diversion dam for the Upper Malad hydro plant, Idaho Power will start construction in 2017 on another fish passage facility, scheduled to be operational by 2018. “Conceptually it’s the same type of approach, based on this being so successful,” Brink said. And, yes, it’ll use the automated imaging system pioneered at Lower Malad. The Hagerman Valley is ancestral land of the Shoshone-Bannock and Shoshone-Paiute tribes. So it's no surprise that one of the best preserved and oldest skeletons of its age — known as the Buhl Woman — was uncovered in January 1989 in a gravel quarry. The Buhl Woman, between the ages of 17 and 21 when she died 12,800 years ago, is the oldest burial in the Western Hemisphere, said Shane Baker, Idaho Power senior archaeologist. "We don't have many human burials from that time period," he said. The Buhl Woman's skeleton was discovered in a Buhl Highway District quarry near Kanaka Rapids. She was buried with a bone needle, a 4-inch Clovis point and a hair ornament. Native Americans lived, hunted, fished and gathered wild plants in the Hagerman Valley for thousands of years. Archaeological evidence suggests that 4,000 years ago some Native Americans were settling in more permanent year-round villages within the Hagerman Valley due to the abundant resource of migrating salmon, says an Idaho Power kiosk north of Hagerman. "It probably would have been a wonderful location back then," Baker said. Stop at the kiosk — beside U.S. 30 just north of the Malad River crossing — to learn about the valley's Native American history. The salmon fisheries of the middle Snake River provided one of most consistent and abundant food sources available to tribes of the northern Great Basin. But fish were more than food. They also played a central role as a spiritual and religious component of Native American culture. During the mid-1800s a steady stream of emigrants traveling the Oregon Trail passed through the area. They recorded journal accounts of their encounters, and many traded for fish. Under Idaho law, ancient remains belong to Native Americans, so the Buhl Woman was reburied in 1991 on the Fort Hall Indian Reservation. A large stone building riddled with history nestles near a cliff off U.S. 30 in Hagerman. With its windows boarded up, the old Malad River Powerhouse looks a little like an abandoned home. But behind that detailed stonework lies a tale of shrewd businessmen, false promises and an aggressive price war. The historic hydroelectric powerhouse on the Malad River, constructed by Beaver River Power Co. in 1911, was retired from service in 1948. In its heyday, the Malad River Powerhouse was a 5,000-kilowatt power plant that supplied electricity to Boise and Twin Falls. It was built by Lucien Nunn, a prominent early hydroelectric developer, and Charles Hammett, an Oklahoma oilman. Their business idea — to monopolize both water and electricity — was made possible by the Desert Land Act passed March 3, 1877, which encouraged economic development of the arid and semiarid public lands of the Western U.S. Individuals applied for desert-land entry to reclaim, irrigate and cultivate it. To compete with five other power companies in the region, Beaver River Power sold its electricity below cost. This practice caused a rate war that was a major contributor to the eventual collapse of some of those companies, including Beaver River Power's own downfall. Between 1913 and 1914, two of the five competing power companies were forced into bankruptcy, and the remaining three struggled to stay in business. In 1916, the resources of all five were reorganized into a single entity, Idaho Power Co.
Beaver River Power began to lose its foothold in the area in 1914, says an Idaho Power kiosk near the site, shortly after losing a legal battle with the newly created Idaho Public Utilities Commission. It also had other problems. Hammett built a siphon across the Snake River. In 1908, he signed a contract with the Land Board to supply water to 17,666 acres, but he ran out of money. Hammett sold more bonds on the promise of extending his irrigation network. Then he used the new investments to cover old debts, leaving the canal construction high and dry. When farmers didn't get their water, they stopped paying. "Charles Hammet was the Bernie Madoff of the day," said Shane Baker, Idaho Power senior archaeologist. "Hammett couldn't deliver the water he promised." Nunn and Hammett sold their Malad River plant to Idaho Power in 1916. Powerhouses today are usually constructed with equipment semi-outside, but the Malad River Powerhouse contained all of its equipment. Today, it's still owned by Idaho Power and used primarily for storage. Little grows on a wide swath of dark and light tan soil south of Bliss. That's because a July 24, 1993, landslide disrupted 100 acres and continues to grow by slow downward movement. No one was injured, but the slide destroyed a portion of Shoestring Road which provided access to a bridge across the Snake River. And the slide altered islands in the Snake. Why is this area so unstable? From below Bliss upstream to about Hagerman, irrigation runoff combines with clay, silt and sand on top of the basalt, said Shane Baker, senior archaeologist with Idaho Power. "These sediments are super soft," he said. Wet clays swell and become very slippery. Since the landslide, new tension cracks and old landslide scarps cover an additional 100 to 150 acres. As you drive through the Hagerman Valley, you might notice piles of rocks that seem out of place in grassy fields. These melon gravels are the aftermath of the Bonneville Flood, which occurred over several weeks about 17,400 years ago. "Because of the Bonneville Flood," Baker said, "all of this is unstable." Something amazing is happening to a quiet stretch of creek southwest of Bliss. And the birds know it. That’s a female western tanager, Aaron Utz said on a morning walk along Tuana Creek on May 16. A yellow-rumped warbler. A western kingbird. A cinnamon teal. Two gadwalls. Bank swallows and red-winged blackbirds. With palpable excitement, Utz offered his binoculars to show off a noisy yellow-breasted chat and the flame-orange markings around the eyes of a male Bullock's oriole. That call from an unseen quail, he explained, means his female is gone. This lush and active creek is an immense change from the ecological desert that Tuana Gulch was a decade ago: an incised, eroded stream and flora dominated by invasives. In 2004, when Idaho Power’s federal license for hydroelectric production at nearby Bliss Dam expired, the utility began an effort to restore the riparian habitat of Tuana Creek — a requirement of its Bliss Dam relicensing. Past land use in Tuana Gulch had left a landscape with little value to wildlife, said Utz, the Idaho Power senior biologist who leads the company’s habitat mitigation from Milner Dam to Swan Falls. “There was a giant presence of noxious weeds here,” he said, ticking off a list of Scotch thistle, Russian knapweed, poison hemlock and other nasty characters from Idaho’s most-wanted list. The company’s Tuana Gulch Habitat Management Area — about a mile upstream from the creek’s mouth at the Snake River — covers about 400 acres but includes less than a mile of Tuana Creek. That stretch has been transformed. Idaho Power didn’t accomplish this alone. The company killed Russian olive trees and planted willows, cottonwoods and wildlife-friendly trees that produce fruits, berries and nuts. The plantings didn’t do well. But a few isolated locations elsewhere on Tuana Creek had beavers, and beavers are territorial creatures whose young must disperse to colonize new areas. Finally, just enough of Idaho Power’s willow and cottonwood plantings survived to attract beavers. Their dams impounded the creek, slowed it down, broadened the water’s zone of influence and created the conditions that allow native riparian plants to flourish. “The beavers kind of did what we struggled to do,” Utz said. Beaver ponds drowned many of the original willow plantings — “which is a nice problem to have,” Utz said — but new growth stretched up the reshaped banks. Plantings of currants, wild clematis and wild rose are spreading on their own. Young peachleaf willow trees, protected by cages, reach for the sky. Beavers heavily use the coyote willow, but they can’t keep up with the shrub’s growth. Deer, which never disappeared from Tuana Gulch, are more numerous now, and the habitat is home to mink, otters, cottontail rabbits and a long list of amphibians. The engineers of this habitat, however, are so nocturnal they might as well be invisible. Beside a C-shaped beaver dam less than five years old, he watched dragonflies flit above the pond and named off the cattail, goldenrod, stinging nettle, common teasel, veronica, duckweed, sedges and bulrush. He pointed out the viceroy butterfly wings left behind after a bird's meal and an empty duck eggshell left by a skunk, raccoon, snake or other hungry nighttime prowler. “There’s a lot going on here that you can’t normally see,” he said. Sure, you could build artificial ponds with berms and dikes and equipment. But that’s short-term and can be wrecked by flooding. Engineering can’t mimic the natural dynamic. Flood a beaver dam, he said, and the beavers just rebuild. Restore habitat naturally, and it’s long-term. The noxious weeds aren’t entirely eradicated, but Utz calls their influence minuscule now. Midway through his tour of the restoration project, he pointed out poison hemlock on the creek bank, the first noxious weed of the morning. The strategy now isn’t to kill it — too much risk of damaging desirable plants at the same time — but to outcompete it. Later in the morning, Utz came across three Scotch thistle plants about to flower and marked their location with GPS. If one of these thistles is allowed to put seeds on the ground just once, Idaho Power could be managing a Scotch thistle population here for 50 years, Utz said, pointing to a nearby slope once dominated by a forest of Scotch thistle. While the birds have discovered the transformation of Tuana Gulch, the birders haven’t yet. Tourism promoters will tell you about the scenic byway and the state park. Outfitters will offer you whitewater rafting excitement, and a string of river access sites invite you to bring your boat and fishing pole. But our reporters will show you the Hagerman you never knew. AMERICAN FALLS — Between rainstorms, October is gorgeous weather for paddling a calm stretch of the Snake River. While you wait for hotter Malad River trout fishing, watch this engineering spectacle. Fish ladder construction begins. I would LOVE to fish the Billingsley Creek from my kayak and report any catches I make to provide to Game and Fish! Are there any special fishing regulations for the Creek? I just want to make sure I abide by the rules. Thanks!! !